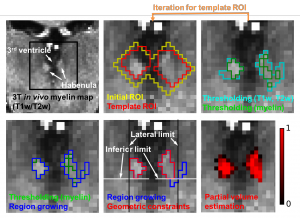 Reproducibility of myelin content-based human habenula segmentation at 3 Tesla. Kim JW, Naidich TP, Joseph J, Nair D, Glasser MF, O’halloran R, Doucet GE, Lee WH, Krinsky H, Paulino A, Glahn DC, Anticevic A, Frangou S, Xu J. 7 Tesla 22-channel wrap-around coil array for cervical spinal cord and brainstem imaging. Zhang B†, Seifert AC†, Kim J, Borrello J, Xu J. Magnetic Resonance in Medicine. 2017; 78(4):1623-34. Resting-state functional connectivity of the human habenula in healthy individuals: Associations with subclinical depression. Ely BA, Xu J, Goodman WK, Lapidus KA, Gabbay V, Stern ER. 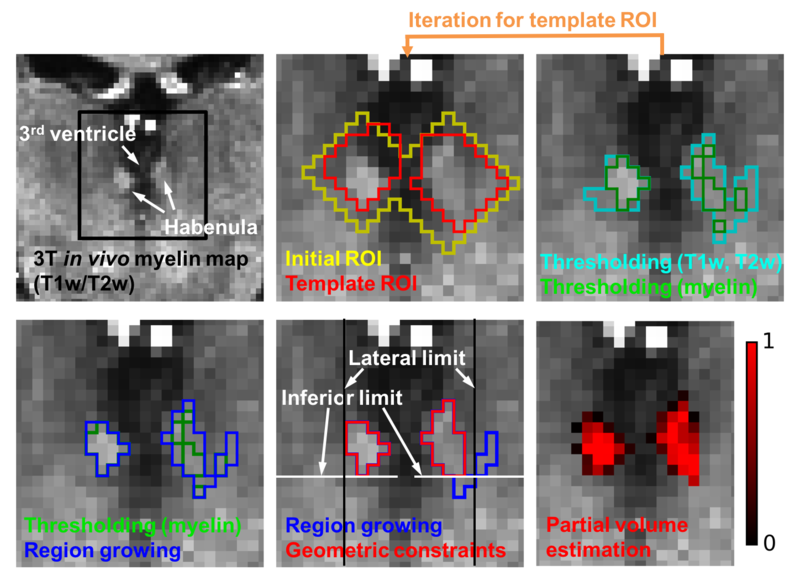 Human habenula segmentation using myelin content. Kim J-W, Naidich TP, Ely BA, Yacoub E, De Martino F, Fowkes ME, Goodman WK, Xu J. The Human Connectome Project’s neuroimaging approach. Glasser MF, Smith SM, Marcus DS, Andersson JL, Auerbach EJ, Behrens TE, Coalson TS, Harms MP, Jenkinson M, Moeller S, Robinson EC, Sotiropoulos SN, Xu J, Yacoub E, Ugurbil K, Van Essen DC. Optic nerve diffusion tensor imaging parameters and their correlation with optic disc topography and disease severity in adult glaucoma patients and controls. Chang ST†, Xu J†, Trinkaus K, Pekmezci M, Arthur SN, Song SK, Barnett EM. Journal of glaucoma. 2014; 23(8):513-20. Evaluation of slice accelerations using multiband echo planar imaging at 3 T.
Xu J†, Moeller S†, Auerbach EJ, Strupp J, Smith SM, Feinberg DA, Yacoub E, Uqurbil K.
The minimal preprocessing pipelines for the Human Connectome Project. Glasser MF, Sotiropoulos SN, Wilson JA, Coalson TS, Fischl B, Andersson JL, Xu J, Jbabdi S, Webster M, Polimeni JR, Van Essen DC, Jenkinson M; WU-Minn HCP Consortium. Sotiropoulos SN, Jbabdi S, Xu J, Andersson JL, Moeller S, Auerbach EJ, Glasser MF, Hernandez M, Sapiro G, Jenkinson M, Feinberg DA, Yacoub E, Lenglet C, Van Essen DC, Uqurbil K, Behrens TE; WU-Minn HCP Consortium. Resting-state fMRI in the Human Connectome Project. Smith SM, Beckmann CF, Andersson J, Auerbach EJ, Bijsterbosch J, Douaud G, Duff E, Feinberg DA, Griffanti L, Harms MP, Kelly M, Laumann T, Miller KL, Moeller S, Petersen S, Power J, Salimi-Khorshidi G, Snyder AZ, Vu AT, Woolrich MW, Xu J, Yakoub E, Uqurbil K, Van Essen DC, Glasser MF; WU-Minn HCP Consortium. Pushing spatial and temporal resolution for functional and diffusion MRI in the Human Connectome Project. Uğurbil K, Xu J, Auerbach EJ, Moeller S, Vu AT, Duarte-Carvajalino JM, Lenglet C, Wu X, Schmitter C, Van de Moortele PF, Strupp J, Sapiro G, De Martino F, Wang D, Harel N, Garwood M, Chen L, Feinberg DA, Smith SM, Miller KL, Sotiropoulos SN, Jbabdi S, Anderszon JL, Behrens TE, Glasser MF, Van Essen DC, Yacoub E; WU-Minn HCP Consortium. Spinal cord tract diffusion tensor imaging reveals disability substrate in demyelinating disease. Naismith RT, Xu J, Klawiter EC, Lancia S, Tutlam NT, Wagner JM, Qian P, Trinkaus S, Song SK, Cross AH. 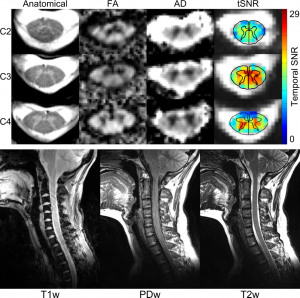 Improved in vivo diffusion tensor imaging of human cervical spinal cord. Xu J, Shimony JS, Klawiter EC, Snyder AZ, Trinkaus K, Naismith RT, Benzinger TL, Cross AH, Song SK. The Human Connectome Project: a data acquisition perspective. Van Essen DC, Ugurbil K, Auerbach E, Barch D, Behrens TE, Bucholz R, Chang A, Chen L, Corbetta M, Curtiss SW, Della Penna S, Feinberg D, Glasser MF, Harel N, Heath AC, Larson-Prior L, Marcus D, Michalareas G, Moeller S, Oostenveld R, Petersen SE, Prior F, Schlaggar BL, Smith SM, Snyder AZ, Xu J, Yacoub E; WU-Minn HCP Consortium. Increased radial diffusivity in spinal cord lesions in neuromyelitis optica compared with multiple sclerosis. Klawiter EC, Xu J, Naismith RT, Benzinger TL, Shimony JS, Lancia S, Snyder AZ, Trinkaus K, Song SK, Cross AH. Multiple sclerosis (Houndmills, Basingstoke, England). 2012; 18(9):1259-68. Diffusion tensor imaging in acute optic neuropathies: predictor of clinical outcomes. Naismith RT†, Xu J†, Tutlam NT, Lancia S, Trinkaus K, Song SK, Cross AH. Archives of neurology. 2012; 69(1):65-71. Increased diffusivity in acute multiple sclerosis lesions predicts risk of black hole. Naismith RT†,Xu J†, Tutlam NT, Scully PT, Trinkaus K, Snyder AZ, Song SK, Cross AH. Radial diffusivity in remote optic neuritis discriminates visual outcomes. Naismith RT†, Xu J†, Tutlam NT, Trinkaus K, Cross AH, Song SK. Magnetic resonance diffusion characteristics of histologically defined prostate cancer in humans. Xu J, Humphrey PA, Kibel AS, Snyder AZ, Narra VR, Ackerman JJ, Song SK. Magnetic resonance in medicine. 2009; 61(4):842-50. Disability in optic neuritis correlates with diffusion tensor-derived directional diffusivities. Naismith RT†,Xu J†, Tutlam NT, Snyder A, Benzinger T, Shimony J, Shepherd J, Trinkaus K, Cross AH, Song SK. Assessing optic nerve pathology with diffusion MRI: from mouse to human. Xu J, Sun SW, Naismith RT, Snyder AZ, Cross AH, Song SK. NMR in biomedicine. 2008; 21(9):928-40.